I can remember the first time I saw the Journey Into Imagination! It was in April 1983! While I had visited EPCOT Center on opening week in October 1982, The Imagination Pavilion was not completed yet, and so wasn’t open. I fell so in love with EPCOT, that I had to return as soon as possible! Upon my return, I was able to take my first look at Journey Into Imagination, and it was worth the wait. 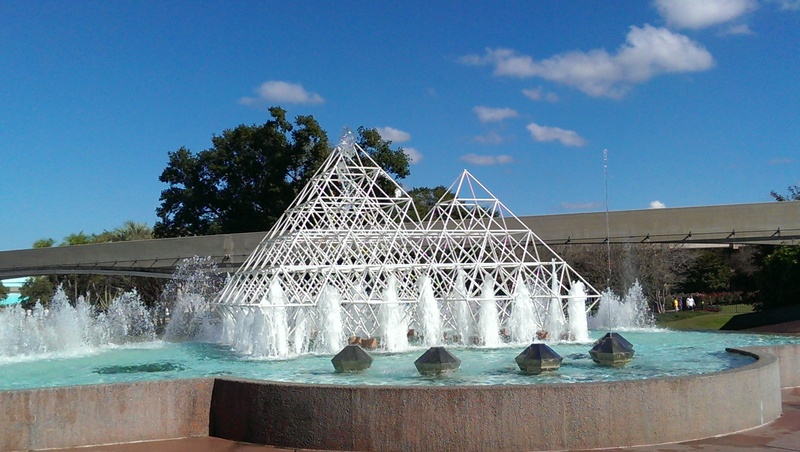 The pyramid type architecture was exciting to see on the outside, which is mirrored by one of the fountains in front of it! Inside was a ride-through presentation that was set on an Omnimover system to help keep the flow of guests moving. The first part of the ride introduced you to Dreamfinder, riding on his specially designed blimp, and Figment with a song written by Disney legends Robert and Richard Sherman, “One Little Spark”. This catchy tune describes what Figment looks like, as well as the vast array of things you can make with an active imagination. From there you entered the Dreamport where all of the collected elements of imagination are transferred into a machine that begins to mix it all together, and storing them for use at a later time. As you move along the ride, you visit four rooms where imagination may have an outlet. Those rooms were: Art, Literature, the Performing Arts, and Science. Each room explores ways to apply our imaginations to create something new and exciting. We are then reminded, by Dreamfinder, that the imagination is the key to unlock the hidden wonders of our world. Over the years, this attraction has changed, A LOT! It is now called Journey Into Imagination with Figment. And, it’s okay, but not as enjoyable. I don’t feel that the current presentation truly encourages the guest to really dive into the world if the imagination. Personally, I would find it a lot more fun and interesting if imagineering would restore the original, or close to it. The end of the ride then sent you to the ImageWorks gallery where there were walls filled with different types of electronic and tactile stations to explore how the imagination can create, even at a moments notice. A person could spend an hour (in air conditioning) and not even notice the time! I still visit the current attraction, but really hope for a return to the original (maybe with a few technical updates). This attraction has been added to the Fastpass+ System, but is normally not needed as the line is generally pretty quick moving and has a low stand-by waiting time. Next Next post: What’s The Attraction?